We have been inundated with requests to show how the Ukraine is split when it comes to Russian speakers and Ukrainian speakers. So we have put together a political map of the Ukraine showing the make up of Russian speaking population in the Eastern end of the country. We have also shown where the flight MH17 was shot down. Most of the area currently in dispute, lies within the region of Donetsk. MH17 was shot down North East of the city of Torez that lies within this region. The Crimea to the south has already been effectively annexed by Russia although this has not been recognized by any nations. When looking at this map it begs the question. Why was flight MH17 even flying through that region? There has been intense fighting in the area and many other airlines have been avoiding the flight paths that pass through this war zone. 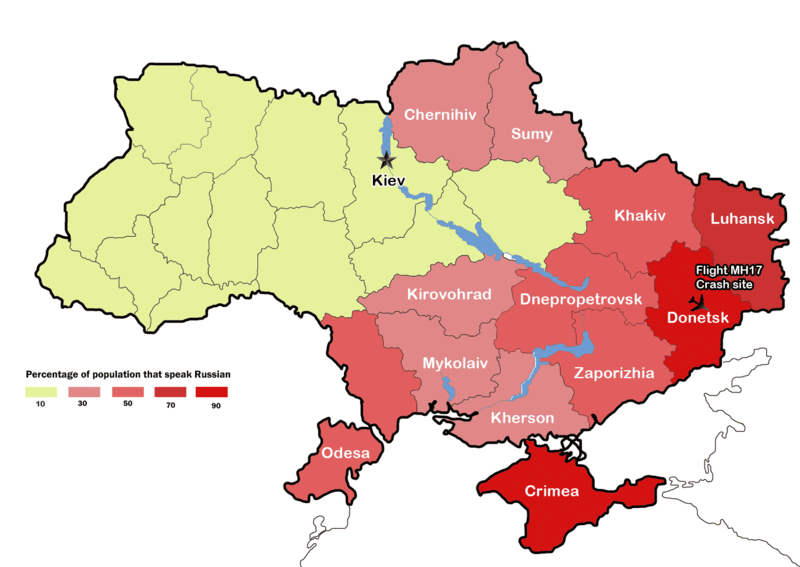 You will note that the Crimea and Donetsk are the two regions that have the highest Russian speaking population in the Ukraine and are effectively the only areas in dispute to date.